Ridley Scott Is Still Working On Alien: Covenant 2? While Katherine Waterston hasn’t heard anything about Alien: Covenant 2 for some time, according to Deadline’s coverage of the current Disney/Fox merger Sir Ridley Scott is continuing to develop the sequel to Alien: Covenant. 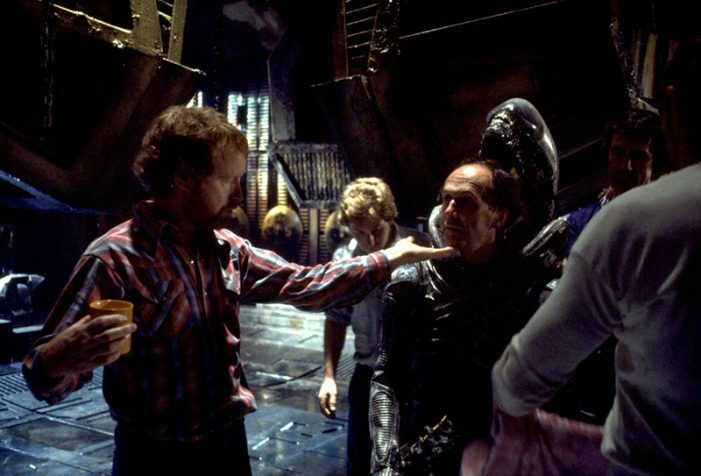 Sir Ridley Scott on the set of Alien with Eddie Powell in the Alien costume. Though he did speak about potential ideas for the sequel back in 2017, Scott hasn’t actually spoken about any potential new Alien film for some time now. He did, however, comment on hoping Disney continues to use the Alien series. It now sounds like 20th Century Fox Film will be remaining under Disney ownership, along with Fox Family and Fox Searchlight. Unexpectedly, Fox 2000 is not surviving the merger. While it’s still not confirmed how the non-Disney image properties are going to be handled, it is possible we’ll see them live on under the Fox Film brand. There Is No Completed Script for Alien: Covenant 2 (aka Alien: Awakening)? I enjoy the idea that the Alien is living death, so that's where that idea comes from. It's sorta a thing that had to pierce reality itself to exist. So spitballing, I'm really sick and I came up with this idea for an opening to the third/final Alien Prequel, I was thinking about the opening to Covenant and how much I loved that scene. We open on static, a television screen- we see Weyland soon after he created David, he starts speaking about the idea that David's going to help us conquer the stars before an interviewer asks him what his inspiration was for creating David, Weyland tries to think and visibly is upset and appears to be getting a headache before instantaneously becoming quite stoic and responding (paraphrasing) "I had a dream, of a utopia and then I had an insatiable desire to create... David." Auditorily we continue to hear this but visually the perspective shifts to "eons ago" (in the second or first galactic calendar day of the Big Bang let's say) A truly biomechanical world is shown, with Gash's Space Jockey (with a retractable "tube" from it's face) moving around the interior of what would become, the Derelict. It shows the SJ in the chair, with a transparent visor lowering over it's head. It dreams. Whilst Peter Weyland narrates about how if humanity can't find a way to evolve we will go extinct within generations- it visually shows empty buildings of the SJ, with humongous dead corpses strewn around, with dead shrimp like children in the arms of many. They are worn away, they have been here for millennia still, they starved- there were far too many. So remember those bizarre silo things that were cut from the original Alien and were down by the Eggs? Yeah, turns out they open. It shows the silo/pod empty, full of water. The SJ goes to its' chair, and dreams- Peter Weyland monologues alongside the visual of the SJ dreaming, waking up and checking the pods, repeat. Peter Weyland talks about how he was overjoyed the first time he'd created David, David 1 but it was not correct. Whilist simultaneously we see the SJ lift a wriggling shrimp like creature alive- until it stops, lifeless. The SJ gently places it back inside the pod from whence it came. Peter Weyland talks about how he mourned for David 1, but persevered onwards to perfection. The SJ dreams again, in the dream the dead child slowly malforms and transforms into a Facehugger, a Queen Facehugger, an inner jaw pierces the vision. The SJ awakens and walks forward to see one pod is open, the pod it placed the poor dead child back into. (Perhaps earlier it could've shown the SJ placing a seed of sorts into the Pod, inferring that it made a mistake by putting something dead in the Pod, instead of something alive. You can obviously parallel this with the embryos David is watching on the Covenant.) The SJ knows something is wrong. It leaves the dead homeworld, and is chestbursted. It crashes on LV-426. You could end the prologue here, or here's a little extra. We see what we assume are human explorers, and in a way- they are, up close they are revealed to the audience as the pigmentless humanoids known to the audience as the Engineers. With an aesthetic all their own, with parts of the SJ aesthetic creeping in- we see an elder Engineer kneel and the only subtitled line in the whole opening is spoken. A younger Engineer, very much like the Last Engineer from Prometheus' ending walks along the interior of the Derelict, opening the pods with a gentle touch as he moves along. All are empty, except one at back of the large chair. Already open, he insert (A gloved hand) into the fluids. And lifts a particle onto his finger, says nothing and the camera exactly mirrors the framing of David's famous line, big things have small beginnings. Wow! Amazing! I like the idea about transforming (or I should say - transmorfing) a dead corpse into a new grotesque lifeform. Really very alieny. Very cool, I really like some aspects of this though if David is revealed to not be the true creator of the Xenomorph I don’t think it should be at the start of the film. Our boy David will finally become a man. David needs to groin burst, to finally have a Willy. It's tricky to rock a rhyme, to rock a rhyme that's right on time. It's tricky tricky tricky tricky! Haven't we thought that franchise killed after Alien 3? After Resurrection? After AvP movies? Point is that once profitable franchise sooner or later ALWAYS get continuation. I never thought it was killed for the unforeseeable future after Alien3. After Alien Resurrection, yes. And we had to wait 15 years for another solo Alien film. That's more waiting time than I want to endure again. Reversed image on me? Tricky one! And he got chestbursted despite being an android? David's final failure, a biological body reminiscent of the humans that he so detests, ultimately leading to his own creation defiling him and usurping his reign just as he did to his own creators. I'm sorry, but continue this downwards trajectory with another David movie, have a third film that may even perform worse than Covenant, and end up killing the Alien film franchise for the unforeseeable future? No thanks. But we still didn't see David in the Space Jockey suite, when he piloted and crashed Derelict. And he got chestbursted despite being an android? Well Ridley can just retcon that too. Aliens can impregnate synths if he wants. If a Covenant sequel wraps up the David story and puts the franchise on hiatus for some time, so be it. And i really would love to see scene in possible Covenant sequel where David will finally faces Engineers with his army of fleshy Xenos but they will use their own biomechanical Xenos against fleshy ones. I would love to see that universal upset on David's face in that moment when he will realise that in the end of the day he actually didn't create anything . Hopefully Ridley Scott and Denis Villeneuve create a 2/3-hour-epic final prequel revealing David's incorrect- the Alien's a Lovecraftian creation of the Space Jockey (The Engineers inherited SJ tech) and it leads to David's downfall. GODDAMMIT! YOU"VE STOLE MY THOUGHTS! One good Ridley Scott Prequel, a excellent prequel trilogy finale > Everything else. Works for me! That would be perfect. Ah, as per usual, polling always tells a different story, bring on the Covenant sequel; turn the weirdness and psychosexuality up to 11, Ridley, *slurp*. Personally my favourite option was to see the Blomkamp film - especially after the concept art he shared. You can really tell he 'gets' the franchise and it would have been great to see Ripley and Hicks on screen again. Seeing as that isn't going to happen, my preferred option would be any other sequel - perhaps a sequel to Resurrection but set on Earth. I just have no desire to see a Covenant sequel, especially as it would likely conclude with a link to Alien. I'm done with the Engineers. I think it's amusing that majority prefer to see Covenant sequel than anything else. And i think ending of Covenant was pretty tricky: even if you don't like movie in whole you still eager to know where it goes next. Nobody's going to read a 301 page spec script. Even if you submitted it to an agent, they'd just as soon dump it in the bin than even open the package when they felt how heavy it was. Unless you're an established screenwriter with an agent you have zero chance of somebody at Disney/Fox picking up a spec screenplay involving one of their IPs. Even then, the chance would be remote - like 0.1%. Just being realistic here Mark Swaine - if you enjoy writing and think you're capable enough then write something original not based on an existing IP and submit to screenwriting contests. If you have an interesting enough story in your 301 page screenplay then just adapt it to an original story and remove any references to Alien. Also, definitely cut down your page count unless you plan on directing it yourself - 301 pages = a FIVE HOUR MOVIE (approx). I think the best you can hope for with fan work is uploading it online for no profit and seeing if the fanbase praises it. Neither is going to read an unsolicited 301 page screenplay. Especially one based on an existing IP. I was wondering if anyone can help me out with something. I just finished my Alien: Leviathan screenplay and I contacted Scott Free a month ago to ask if for recommendations on which literary agents to submit it to, in the hope they'd say "send it over". One of the main people gave me his direct email so I sent him the pitch. He didn't reply, which is fine. But yesterday I finished the final draft and I sent another email this morning and still heard nothing back, so I called them to see if they were receiving my messages. Then the secretary informed me "they don't accept unsolicited material" , which is what I thought their policy was before I even called them the first time and its probably the reason why the guy isn't replying to my emails (so why give me a personal email in the first place). Basically, this was my "go to" place to submit my screenplay and now I need to start looking around again. I'm not even sure who definitely currently holds the rights Fox or Disney, but does anybody know any agencies that I can submit my 301 page 'Alien Leviathan' screenplay to? Thank you. Too late for your wishes. Take this L.
The only purpose of existence is reproduction. Love? Some people never feel love. I never feel love. I prefer to have sons and daughters. I really wish you wouldn't. And fyi, the good guys won at the end of the Alien Trilogy- it just took losing everything to achieve it. I remember that one, but can't place the movie for some reason. I remember it was from the 90's. It’d be stupid not to green light both a final Ridley Scott film and a Neill Blomkamp film. Opposite; it'd be dumb to greenlight both when one Scott film didn't perform as well as expected, and Blomkamp has a string of "eh" releases to his name. Except that Ridley has made plenty of good movies and Blomkamp hasn't. That is the nihilistic point of view, though as it is a view, it is also your choice. It doesn't mean that the universe is actually as you view it. The view that the universe is guided by some sort of intelligence (may it be beyond our grasp of imagination) remains a valid point of view, in which case, our universe may not be apathetic. It is just not knowable. I also believe this physical universe has rules. Death, loss, and atrophy are part of the system, and often pointless. I believe there is an element of purpose, but i also believe in sh*t happens. There are movies that properly illuminate either concept. Alien excels at nihilism. I think Alien 3 secured that nihilistic tone in the series. It was only a part-element previously. Aliens was a Disney film for all intents and purposes. With a little princess no less. It was a film of loss, but also of hope. It was humanity winning over the darkness, whereas Alien 3 was just about humanity staring off into darkness. The good guys lost. ...and people wonder why the film didn't have mass appeal. Everybody wants to hear the sermon about love, hope and the triumph of good. Nobody wants an hour of hell, sin, and the failure of man. Well if they want to continue making films in this franchise I’d say either would be a good marketable direction to take, eventually followed by the other. Money. Covenant didn't exactly show Alien as a huge property. It'd be a risk for them to bank roll two films in the series at once. Welcome to Camp Handwave Alien 3 Russ! We're a fun bunch over here and we choose great movies over nihilism. This isn't the nineties! Frosty's right, though. Why can't we have both. It’d be rude not to green light both a final Ridley Scott film and a Neill Blomkamp film.